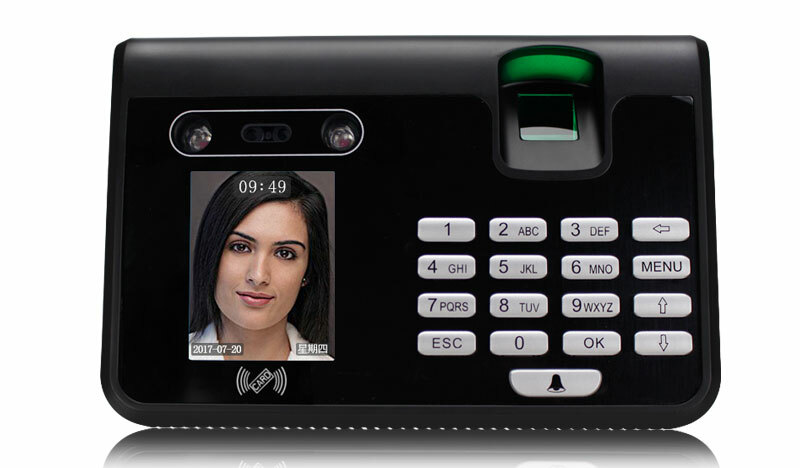 This is an Security and Effective RFID Biometric Fingerprint Face Recognition Time Attendance System Employee Time Clock, Support 300 Faces, 300 cards, and 3000 fingerprints. Perfect for Homes and Offices. Completely solve the ordinary attendance machine punch clock slow trouble. Ordinary fingerprint machines maybe difficult to identify or check attendance, lead to normal queuing, punch or even late. Face fingerprint attendance machine,attendance is fast, multiple functions, simple and convenient operation. Simple and quick operation, register attendance query all may operate on a machine, can direct export Excel report,clarity. Use dual cameras, infrared optical system, good photography, identifiable day and light,indoor and outdoor. All identifiable that much,like beard, glasses, mask, makeup natural expression. Non membrane fingerprint identification is faster and more accurate. Use non membrane fingerprint collector. Accept dry and wet, coarse and fine finger, use long time. Automatically generate reports. Support U disk upload and download directly, convenient and quick! 1.Plastics button. Key sensitive response, feel comfortable, fashion simple and clear. 2. Fingerprint Collector. Use non membrane fingerprint collector, all can accept with dry and wet, coarse and fine finger. 3.With 2.8 inch High Definition Screen. Clear display, can see the parameter, simple and easy. 4. Pedestal support. Use steel material, present 8 screws. More secure installation!